I have a confession. I went to bed on Friday unsure about attending Sussy Day. Now, I LOVED the concept and purpose of Sussy Day. And I obviously love The Sussy Project. But I was completely overwhelmed with work. I had 13 award nominations to write. A campaign to work on. And (okay, I won’t bore you with all the details and projects). But before I could make up another excuse, I reminded myself of the unthinkable tragedy the day before. I thought of the children…the children and teachers whom I’ve never met, but have changed my life. On the first day of class, the philosophy professor stood behind a table that had on it a large, empty mayonnaise jar, a box of golf balls, a box of pebbles, and a box of sand. When the class began, wordlessly, he picked up the very large and empty mayonnaise jar and proceeded to fill it with golf balls. So the professor then picked up the box of pebbles and poured them into the jar. He shook the jar lightly. The pebbles rolled into the open areas between golf balls. The professor next picked up the box of sand and poured it into the jar. Of course, the sand filled up everything else. “Now,” said the professor, as the laughter subsided, “I want you to recognize that this jar represents your life. The golf balls are the important things–your family, your children, your health, your friends, your favorite passions–things that if everything else was lost and only they remained, your life would still be full. “The pebbles are the other things that matter like your job, your house, your car. The sand is everything else–the small stuff. “If you put the sand into the jar first,” he continued, “there is no room for the pebbles or the golf balls. The same goes for life. If you spend all your time and energy on the small stuff, you will never have room for the things that are important to you. Pay attention to the things that are critical to your happiness. Play with your children. Take time to get medical checkups. Take your partner out to dinner. Play another 18. There will always be time to clean the house, and fix the disposal. I pulled myself out of bed and told myself that my laptop was staying closed today. The sand will not win today. I made up my mind to focus on the golf balls, the pebbles, and the beers. And I’m so thankful and happy that I pulled myself out of bed on that rainy morning. 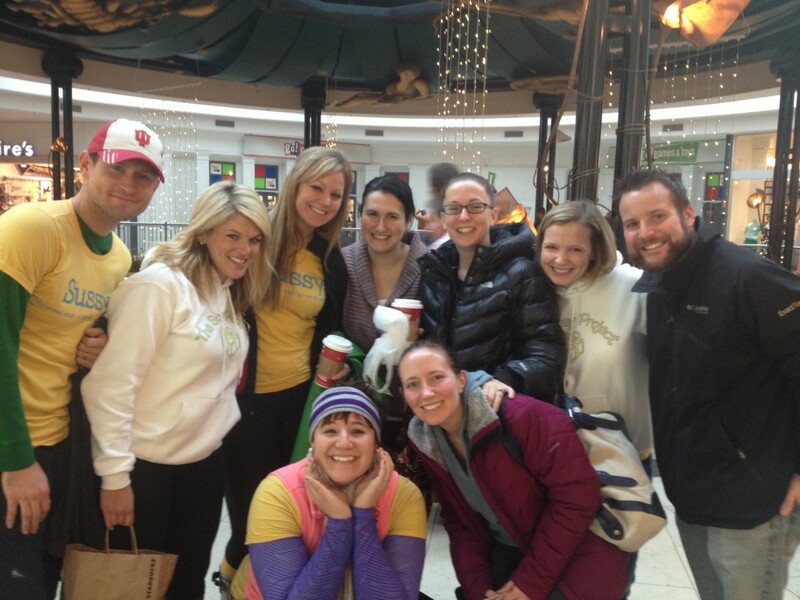 We passed out hand warmers, candy, gift cards, and Sussy t-shirts to people in the mall. We wrote 36 Christmas cards and Meggie gave the Starbucks crew a $100 gift card to use on the patrons. Dalton Dingus has a dying wish to break a world record and receive the most Christmas cards. We wrote him 36 different cards. We decorated tags wishing people a Merry Christmas & Happy Holiday. I didn’t have Christmas colors, so I was wishing people an even brighter holiday with those neon colors. 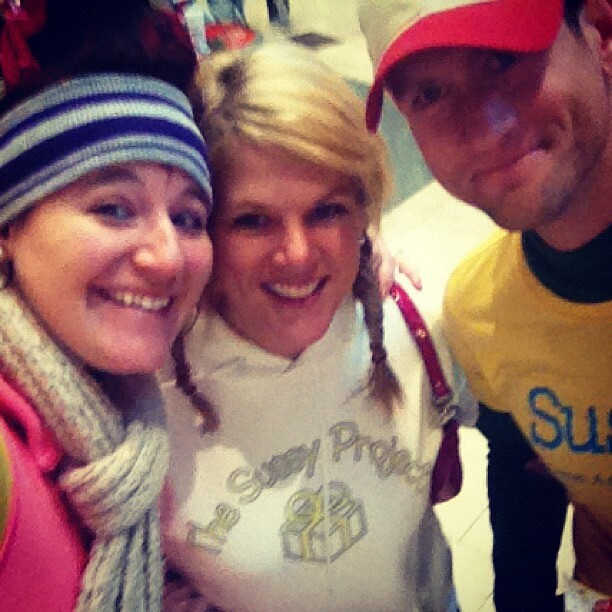 Surprising people with gifts at the mall with Josh and Meggie. The Sussy Squad – all smiles after a successful morning. The rain stopped and the gifts began. 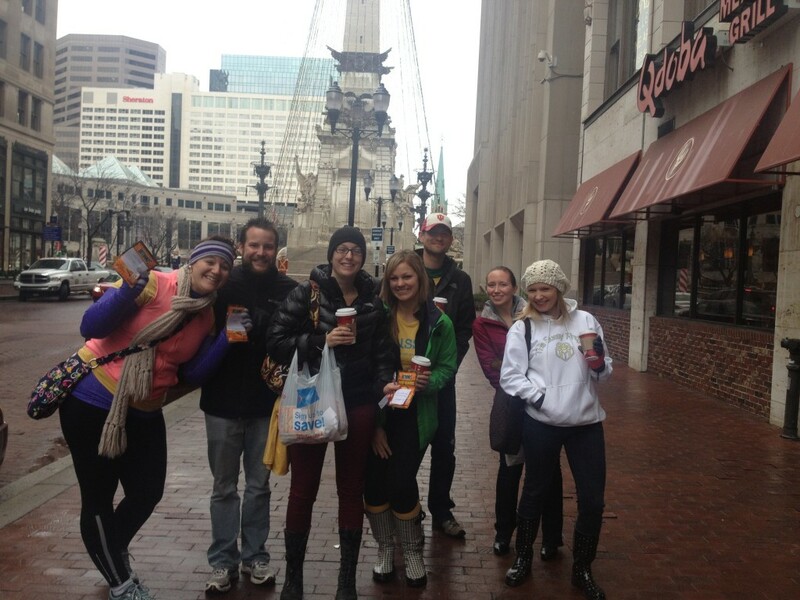 The Sussy Squad takes downtown Indy! One of the most touching moments of the morning was when a woman came over to thank us for her coffee. We all held back tears, but managed to say “you’re welcome” + wished her a Merry Christmas. The day was perfect. I shared many laughs and made new friends. And best of all, I spent the rest of the day smiling and wanting to spread love to everyone who crossed my path.